← Arrival in Cancun, Mexico! Trev-heads Chris and Alexandra are in Morocco. 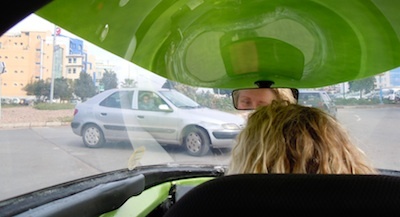 They have unpacked Trev, checked over the car, topped up the battery, and driven in the chaotic Casablanca traffic. Apparently they are not the only drivers unsure about which way to go around round-abouts. Today they will drive to Rabat, the first stage of the final leg through Morocco, Spain, France and Switzerland to Geneva—the end of the first around-the-world Zero Race. Your journey is long but almost over and our thoughts are with you all the time.